- Advertising: Was kostet eine professionelle Übersetzung? At any time tens of thousands of security guards are busy guarding somebody or something. Hardin Security Ltd. has cut a slice of this lucrative pie and employs a couple of hundred security guards in the UK. Hardin Ltd. offers several security services such as, uniformed and civil shop surveillance, company, building and personal protection and any kind of security patrols. The different assignments spread over the whole country (even the Shetland Islands) have to be coordinated fail-safe. E-mails can be forwarded to the securities - no more annoying dispatch of operation schedules. An SMS reaches the recipient and can be reread. The hands know they are always up to date. It's easy to reach a whole group. SMS are fast, reliable and unambiguous. Fact: The short and concise communication by SMS results in simple an efficient coordination of hands. Thanks to the AUTOREPLY feature of the ASPSMS System messages can be sent to Outlook. The answer messages get sent to the Microsoft Outlook 2007 Inbox. 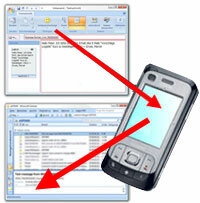 The coordinator stores mobile numbers of the guards in the Microsoft Outlook 2007 address book. Additionally he holds groups by various criteria. Rock Hardin who founded Hardin Security Ltd. has just sent a reminder for a self-defense course in Sheffield to the 40 guys of the local Motorcycle Club who are long-serving employees of Hardin Ltd.
SMS-OUT: Hi folks! Don't forget the course tonight at Kings Lane 11 which you have signed up for! Because of the AUTOREPLY function Rock gets the answer messages from his colleagues in the Outlook 2007 inbox. A look into his Outlook Calendar tells Rock that there is no reason to refuse this invitation. He gets a train ticket online and marks Tuesday and Wednesday of the following week as holiday. SMS-OUT: Hi Dan, nice to hear from you and thanx for the invitation! I'll be there. And I will bring the whisky - the good one!! See you Tuesday.. It's easy to set up a reminder SMS: Rock right clicks the concerning item in the calendar, selects forward as text message, enters his own number as recipient and amends the sentence with "get whisky!!". With the option Schedule Send he schedules the text message for Monday evening. 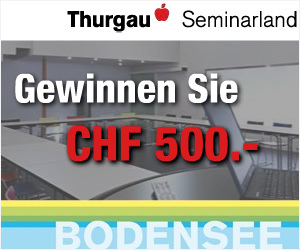 Jetzt an der Verlosung von Thurgau Tourismus teilnehmen:Gewinnen Sie CHF 500.00 für eine Tagung im Seminarland Thurgau. Rock got a phone call from a customer who had some troubles with a gang. The customer wanted two more securities in front of his club for the next couple of days. Hardin Ltd. has got some more guards in this area of course. Because Rock has classified his contacts by towns he can reach the concerning employees with a few clicks. SMS-OUT: (to the Groups Leeds, Manchester and York) Hi folks, it's Rock! Looking for two guys to make four night shifts at X Club in Leeds. SMS-OUT: (Ty and Leroy) Thank you for the quick answer. You get the job. The address: Club X, Springwell Rd. Leeds. Contact the manager, Mr Eccles at 8 o'clock on Thursday at the club. See you. SMS-OUT: (to Mr. Eccles) Ty and Leroy will make the job. They will contact you on Thursday at 8 o'clock at the club. Sincerely yours Rock Hardin. Rock usually sends a reminder to his employees. As described above he sets up a Scheduled SMS to Ty and Leroy and the Outlook Mobile Service will manage the rest. Thanks to the seamless integration of the Outlook Mobile Service, Microsoft Outlook 2007 works as perfect communication centre for Rock Hardin. Thanks to the adoption of SMS communication the costs for phone calls could be reduced significantly and a wide network of employees was be set up. Berechnen Sie jetzt online Offerten für eine professionelle Übersetzung nach dem 4-Augen-Prinzip. Über 20 Sprachen. Nahezu alle Fachgebiete. Lieferzeit innerhalb 6 Stunden.